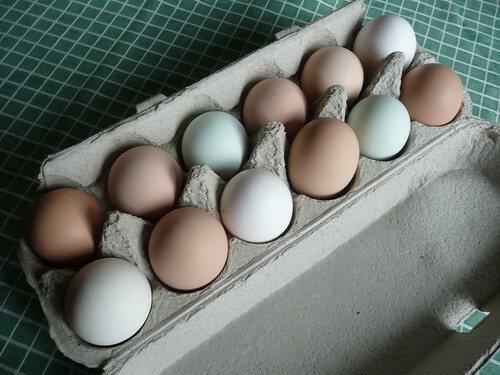 A dozen multicolored eggs from Quilcelda Farm--organic, free-range, local and (much more likely to be) salmonella-free. Look at those pale green ones! Lovely. A variety of tomatoes from Billy's, my favorite farmers market stall. They are located in eastern Washington where it's much warmer and sunnier than Seattle, so I can rely on them for summer favorites like tomatoes and peaches. A lot of area restaurants rely on them too--I often see local menus specify that they're using Billy's produce. Best of all, they sell their "seconds," produce that's a little bit odd or ugly, for far cheaper than their picture-perfect cousins. This herbed cheese is called Ladysmith, from Samish Bay Cheese. It's light and summery and delicious. The brie-like thing is a scrap of leftover something my housemates brought home, and the basil is from our CSA produce box from Oxbow Farms. The best thing about summer produce is how little you have to do to it. 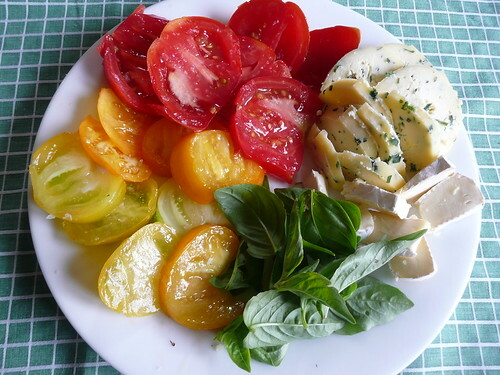 Slice up some tomatoes or bell peppers or peaches, add a bit of cheese or hummus and perhaps some crackers, and you've got yourself a lovely small meal with almost no effort. This plate made a perfect afternoon snack to share with a friend.